What does strut mean? Where I can apply the word? I need to know what you call the things in the picture and what strut means. Are those struts in the picture? I might call these the legs of the board or whatever the object is called. The stand would be the entire standing apparatus, perhaps, but certainly "the legs" is the best way. I think the strut is actually the horizontal metal strip between the two sides of the board. It keeps the two sides from pressing back together. A strut is a structural piece designed to resist pressure in the direction of its length. It seems there is some debate if the piece I refer to is 100% technically a strut--I have always heard it referred to that way, and believe that in colloquial usage it would be an appropriate word. But it seems if you're writing for a technical description, it may not be appropriate. The picture shows a board in a frame and this is attached to an A-frame structure. 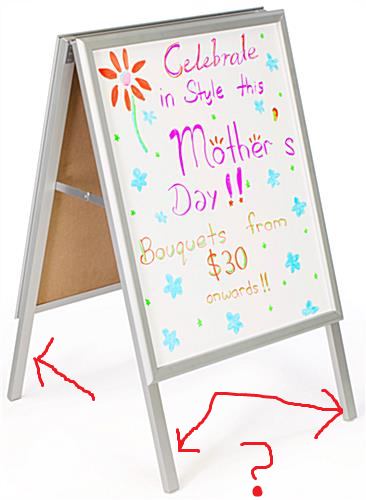 A-frame structures for this usage (holding up a board) have legs. struts are not relevant here. Struts are cross-beams, therefore, usually horizontal, used in the construction industry to strengthen vertical loads and also on guitar necks to so different notes can be played. On guitars, struts are vertical. Struts can also be found in certain pieces of furniture where they reinforce some structure. For examples, some beds have a frame made of wood with cross pieces called struts where a mattress is placed. The engineering definition of a "strut" is simply a component which has a compressive force acting along its length. That definition certainly applies to the parts of your frame marked with the arrows. In contrast, it does NOT apply to the horizontal links between the two boards, which are in tension not compression. An engineer would call those parts "ties". However, non-engineers would describe the arrowed parts as "legs," not "struts," just like the "legs" of a chair or a table. In common non-engineering American English, the main familiar usage for this meaning of strut is as part of the suspension in cars, since they need service/replacement from time to time. Keep in mind strut, as a noun or verb, can also be used for a particular way of walking, and this meaning is probably more familiar. What does “do” mean in “What do I do”? What does “ethnic X”, where X is the people of a country, mean? What do you call this place where various goods are sold? What does 'on' followed after 'call' mean in each sentence?